What would you do if you won a million dollars in poker? Does anyone play the lottery or scratchoffs? What other games do you play at the casino? I like the penny slots. Which are 45 cents really cuz you gotta play all ways lol. And I can kick myself everytime I buy a scratchoff cuz I NVR win lmao. If I won a million bucks at poker I would invest half, share a quarter, and BLOW a quarter. You only live once..right!!?!! Re: 08/15/10~What would U Do? 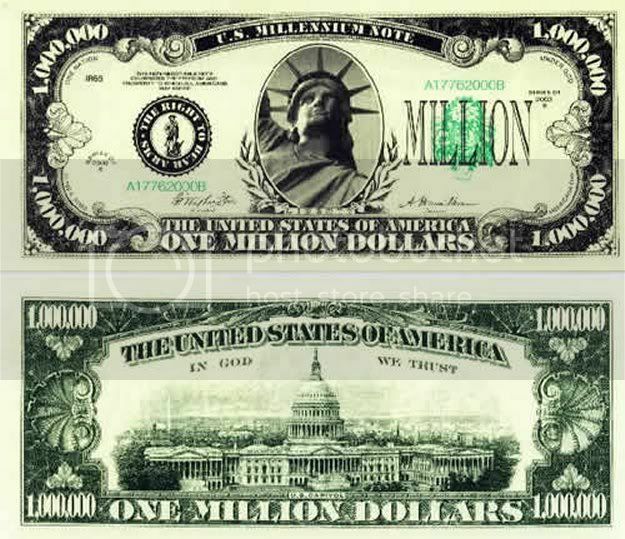 If I won a million dollars I would donate $100,000 ; put $5000 in my Full Tilt account ; save $50,000 for vacations ; buy a nice car ; put the rest in the bank. spend it all on drugs and midget hookers. If i won the million dollars I would use half of it in establishing a career as poker professional. I dream of winning a major poker tournament (EPT, WPT or WSOP) and then getting sponsored by a major poker company preferably FullTiltPoker, and living a dream life in vegas.